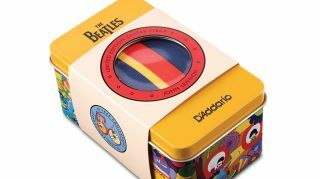 In celebration of the 50th anniversary of The Beatles' Yellow Submarine animated film, D'Addario has announced a new guitar strap and pick collection, featuring art from the movie. The straps come in four designs printed on polyester. The designs are inspired by the appearance of each Beatle in the movie. The straps come in a commemorative tin that features art, characters and imagery from the movie. The picks come in five designs inspired by art from the film printed in 4-color on celluloid picks. They are available in three gauges: light, medium and heavy. The straps are retailed at $60 MSRP and available October 1, 2018, while the picks are retailed at $11 MSRP and will also be available October 1. For more on the commemorative collection, head on over to daddario.com.